There’s nowhere on the diamond where the comfort and play-ability of a glove makes more of a difference than behind the plate. When you’re catching and your glove lets you down, you’re more likely to end up sitting on the bench than crouching behind the plate the next inning. Rawlings is one of the premier names in baseball equipment, and their 34-inch Mocha Pro Preferred catcher’s mitt is one of the most reliable, durable, and comfortable catcher’s mitts you can own. It’ll help you bring your game to the next level. The Rawlings Pro Preferred Catcher’s Mitt is a one-piece, closed web design for maximum durability and strength. At 34 inches, this mitt is Rawling’s biggest, and one of the bigger gloves on the market. It’s big enough to catch the occasional knuckleball, or those nasty sliders off the plate. The glove’s one-piece construction with a closed web is built for strength, and Rawlings only works the leather to about thirty percent of its final suppleness so you can mold the glove to your own hand. The unstructured hand pocket is lined with Pittard’s sheep skin, which helps with cushioning while it wicks away sweat and gives you a good, non-skid grip. 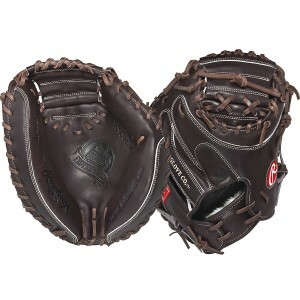 The Pro Preferred Catcher’s Mitt is made from premium Kipskin leather and is dyed a handsome Mocha color. Instead of a conventional double leather palm, the Pro Preferred has a Poron XRD palm protection pad inside the glove that drastically reduces the impact of the ball on your hand, and allows you to keep playing long after other gloves would have you wincing at every pitch. If you’re an adult catcher, or play professional or semipro ball, you’ll be glad you traded up to a glove like the Rawlings Pro Preferred 34 Inch Catcher’s Mitt. Pitchers like the big target it presents, and they’ll appreciate the way the closed web lets you scoop errant pitches out of the dirt with ease. 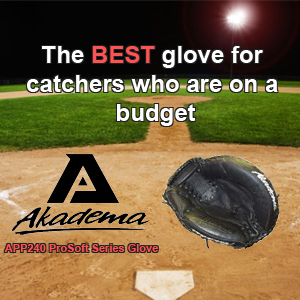 Catcher’s mitts take a lot of abuse during games and practice, so you’ll really appreciate the robust construction and the Tennessee-tanned laces that can withstand 100 pounds of force without breaking. The Rawlings Pro Preferred is reinforced heavily at common fail points for a catcher’s mitt, but does not sacrifice feel or the ability to break the glove in. It’s a truly great mitt.